Opie is a 17" muscular and lovely temperamented Mini American. He is AKC pointed and a UKC Champion and has a beautiful correct coat and throws it. He has produced some beautiful examples of our breed as well. The results listed below represent genetic disease tests performed by Paw Print Genetics on this dog and are based on the sample(s) submitted to Paw Print Genetics. 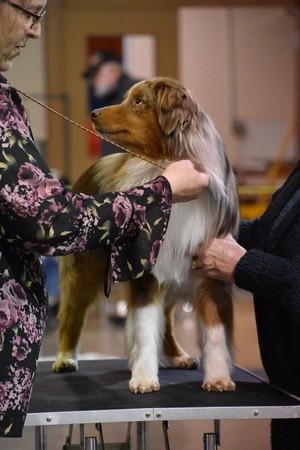 The results listed below represent genetic trait and coat color tests performed by Paw Print Genetics on this dog and are based on the sample(s) submitted to Paw Print Genetics. Paw Print Pedigrees is an open website set up by Paw Print Genetics so that breeders and owners of dogs that have been tested in the Paw Print Genetics laboratory may voluntarily opt to share their canine genetic testing results. Paw Print Genetics and Paw Print Pedigrees do not make any claims to the accuracy of the information displayed for breeders or dogs, with the exception that all testing performed by Paw Print Genetics is accurate and reflects the results of the dog displayed. Those wishing not to publicly display their results should not share their results. This site is voluntary and any participant may decide to remove certain genetic test results or other information at any time. The test results and other information chosen to be displayed or removed are selected by the participant. Therefore, test results displayed may not reflect all testing performed in this dog. Copyright 2013-2016 Paw Print Genetics®. All Rights Reserved.